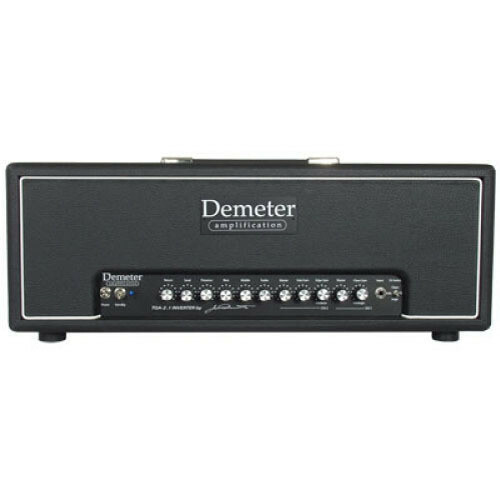 The Demeter TGA 2.1 T-20 22-Watt Tube Guitar Amplifier Head by Demeter features an all-tube, two-channel design that is capable of up to 22 watts of output. Its Clean channel features a Bright switch, and the Edge channel has a second variation called Boost mode, which engages a tube-driven version of Demeter's Fat Control, providing a midrange boost for classic lead tones. Both channels have independent Gain and Master controls, while the active Presence control is universal. The TGA 2.1 T-20 has a tube-buffered effects loop with front-panel controls that allow you to adjust your Send and Return levels without having to reach for the back of the head. A rear-panel Pentode/Triode switch allows you to cut the amp's power by approximately 50%, changing the character of the amp and increasing its pick sensitivity. The included footswitch gives you control for switching channels and engaging the Boost on the Edge channel.